Concept: This group represents early to late successional mixedwood Vegetation Type (VT) found on zonal sites within the Acadian Ecosite groups. Vegetation types can be difficult to categorize at times due to variation in tree species mix and abundance. Earlier successional stages are dominated by red maple, white birch and balsam fir, but they usually contain residuals from past stand-level disturbances. Late successional stages contain yellow birch along with red spruce or hemlock. Herb and bryophyte diversity is high and coverage can be extensive, especially in the yellow birch mixedwoods. Early and mid successional stages are usually even-aged whereas late successional stages can develop uneven-aged characteristics due to the longevity of dominant species. Vegetation: Vegetation types are closed canopy forests with a range of species depending on disturbance history. Earlier successional stages are dominated by red maple, white birch, aspen and balsam fir; while later stages have red spruce, hemlock, yellow birch and sugar maple as dominants. The shrub layer consists mainly of regenerating trees and the herb layer is comprised of typical woodland species. The presence of several fern species is not unusual. The extent of bryophyte cover depends on the abundance of hardwood species and the related loss of spore germination sites due to leaf litter. Environmental Setting: Vegetation types in this group are found on a range of slope positions. Most sites are non-rocky, but surface stoniness can be variable. Soils are mainly derived from glacial till deposits. 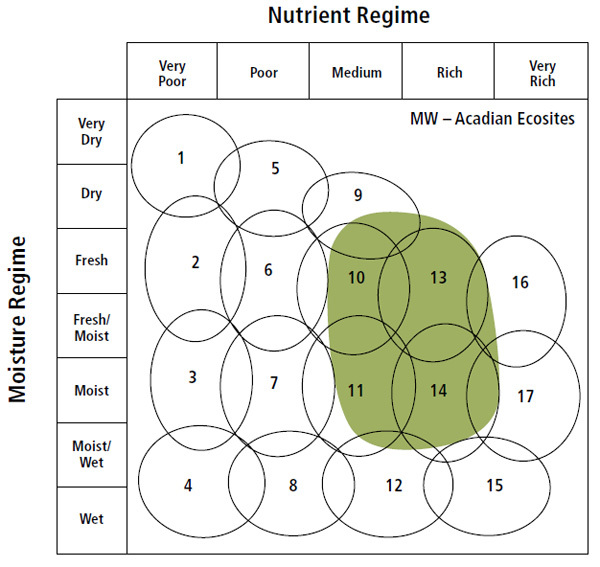 A wide range of moisture levels can be found, but fertility is generally medium to rich throughout. Various VTs form the matrix forest or large patches in many ecodistricts. This group is found throughout the province except in the Cape Breton Taiga (100) and Atlantic Coastal (800) ecoregions. Successional Dynamics: This group is associated with early to late successional zonal VTs. Depending on site conditions and disturbance history, eventual climax forests are either mixedwood or softwood VTs dominated by red spruce, hemlock, yellow birch, sugar maple and beech. Mid-successional stages usually have a significant component of red maple, white birch and/or balsam fir in the overstory and are typically even-aged. Late successional stages dominated by shade-tolerant species will develop an uneven-aged structure between infrequent stand-level disturbance events. Disturbance agents include hurricanes (windthrow), fire, insects and harvesting. Ecological Features: Mixedwood forests embody features of both coniferous and deciduous ecosystems, composed of either shade-tolerant or intolerant canopy species, depending on the mechanism of stand origin. These large patch to matrix forests have complex canopy structures including softwood or hardwood inclusions or, more commonly, a blend of both growth forms. Understory plant composition tends to be shaped by overstory structure and soil attributes. Bryophytes are more abundant under softwood canopy components, while deciduous trees promote shrub and herb cover. Mixedwood forests are used by numerous wildlife species, including those associated with both hardwood and softwood forest. Few fauna are exclusive to mixedwood forests but some recur frequently, especially in mature stands. The best known mixedwood associates are birds (e.g. sharp shinned hawk, northern goshawk, veery, solitary vireo, black-throated blue warbler, black and white warbler, American redstart and ovenbird). The potential for old growth and rare plants is variable, depending on successional stage and site conditions.